Professor Dr. Elisabeth Walther-Bense was born in Oberweißbach, Thuringia, Germany, on August 10, 1922. She studied philosophy, German and French philology, mathematics and physics at the Universities of Jena and Mainz, and at the College of Technology, Stuttgart, later to become the University of Stuttgart. There, she was awarded her Ph.D. under Max Bense’s Professorship of Philosphy and Theory of Science with a dissertation entitled: Die Rolle der Logik von Port Royal in der Frühgeschichte der exakten Wissenschaften (The Role Of Port-Royal Logic In The Early History of The Exact Sciences) in 1950 and she earned her habilitation (qualification as a full university professor) with a work entitled Francis Ponge. Eine ästhetische Analyse (Francis Ponge: An Aesthetic Analysis) in 1962. In 1978, she was the first woman to become full professor at the University of Stuttgart in the Department of Systematic Philosophy. To a large degree, it was Elisabeth Walther’s merit that Charles Sanders Peirce’s Semiotics became known in Germany and was applied and further developed particularly at the University of Stuttgart. In 1973, she published Wörterbuch der Semiotik (Dictionary of Semiotics) together with Max Bense. 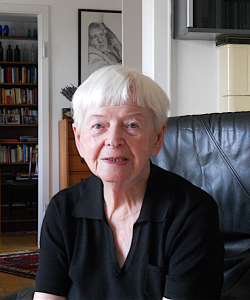 Translated into several languages, her Allgemeine Zeichenlehre (General Theory of Signs), published in 1974, introduced many students to the system of semiotics and inspired them to study Peirce’s work. From 1990 on, Elisabeth Walther-Bense led the interdisciplinary research group for semiotics and aesthetics at the University of Stuttgart, whose work yielded a number of dissertations. Elisabeth Walther-Bense also contributed to making Peirce’s pragmatism more widely known. In 1985, she published Peirce’s essays “The Fixation of Belief”, “How to Make Our Ideas Clear”, “The Doctrine of Chances”, “The Probability of Introduction”, “The Order of Nature”, and “Deduction, Induction, and Hypothesis” in German, based on translations by some of her students. Her treatise Charles Sanders Peirce. Leben und Werk (C. S. Peirce: Live and Work) appeared in 1989. In this book, she documented and explained Peirce’s work on semiotics, science, philosophy, logic and theory of science. In 1975, Elisabeth Walther, in cooperation with Max Bense, Gérard Deledalle and Klaus Oehler, founded „Semiosis. Internationale Zeitschrift für Semiotik und Ästhetik“, a periodical on semiotics and aesthetics. A special edition of this periodical in honor of her 75th birthday – „signum um signum“, 1997/98, Nr. 85-90 – contains contributions by her students and friends on semiotics, computer science, physics, educational science, grammar, logic, translation and cultural analysis. This diversity of approaches is a good indicator for the appeal that the Stuttgart School of Semiotics as developed by Elisabeth Walter-Bense und Max Bense held for students of many fields. Furthermore, the range of interest of the Stuttgart School of Semiotics included mathematics, didactics, architecture, political science and sociology. They further differentiated Peirce’s semiotic concepts and made them available as a universal formula of representation and communication. The festschrift to Elisabeth Walther-Bense’s 80th birthday published in 2002 under the title Kontinuum der Zeichen (Continuum of Signs) included articles on neurosemiotics, epistemology, ethics and design. In the same year, Elisabeth Walther-Bense published a collection of 18 of her essays on semiotics under the title Zeichen (Signs). The eminent semiotic scholar passed away on January 10, 2018 in Stuttgart.